We mustn't confuse pinstripe with chalk stripe. 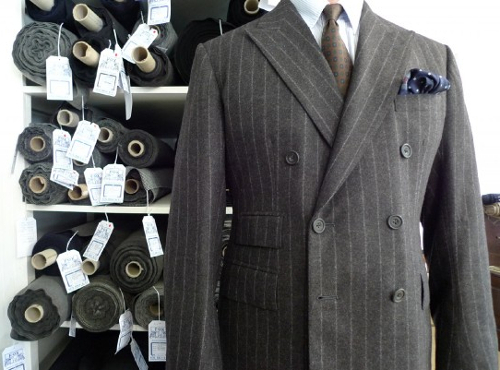 The difference between a pinstripe and chalk stripe pattern on a suiting fabric is subtle, but important. A pinstripe generally provides a thin, uniform and uninterrupted line of close dots. Chalk stripe is thicker and less uniform than a pinstripe, looking, as the name suggests, like lines of chalk. The chalk stripe appears blurred and v. chalky when woven in flannel. Less regimented than pinstripe, chalk stripe is suitable for non-business and less formal occasions. 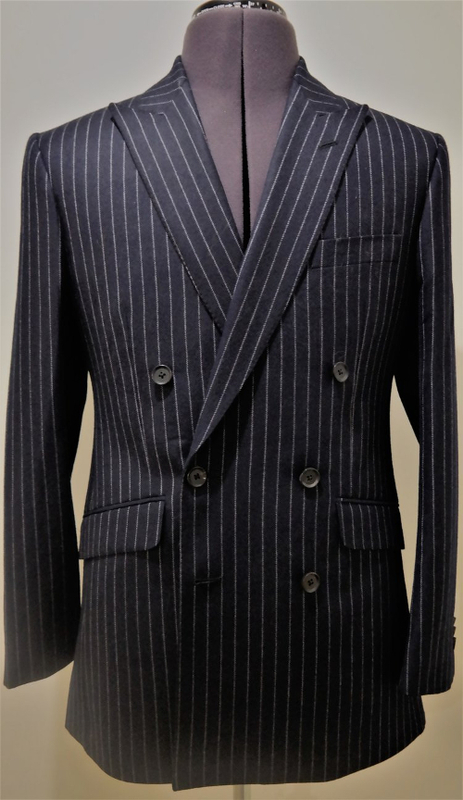 Chalk stripe (and pinstripe) was used to great effect in Kingsman - The Golden Circle, re-establishing it once and for all as a cloth of heroism and reaction. Fox Brothers make world-famous flannel chalk stripes. That's their very elegant charcoal grey 14oz flannel chalk stripe above. Wearing a suit in flannel chalk stripe is quite simply the shortest route to appearing earnest and stylish. 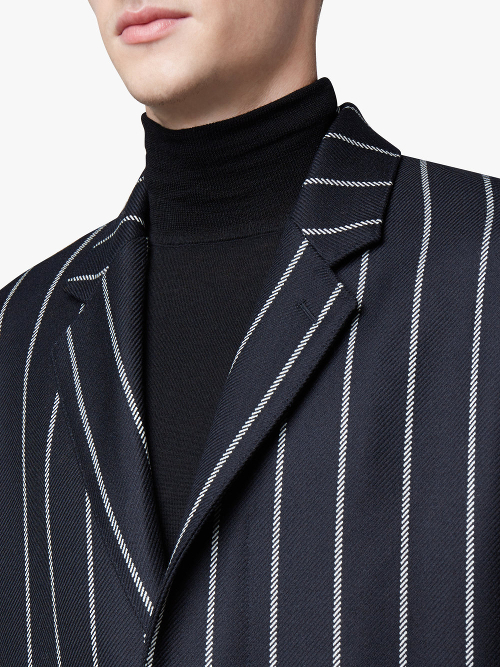 I think it's safe to say, though, chalk stripe like pinstripe works best as a suit rather than a jacket on its own. Don't ask me why. Unwritten rules, old stick. Colmore Tailors of Birmingham understand that the boldness of chalk stripe betokens a man who 'means business, shows confidence and resonates masculinity'. They constructed the double-breasted suit you see in picture below using a 14oz navy chalk stripe from Dugdale Brothers. What a beauty. The client was obviously unafraid of the timeless elegance of classic roped shoulders and a suit made from a durable cloth, despite the onslaught of ever lighter and less structured jackets. What's the point of a tailor if jackets are turning into shirts? I was looking at the jackets of a British tailoring firm with a diminishing reputation the other day and they wouldn't have been so far out of place on the shirt rail. Chalk stripes are to be found on more than suits too. 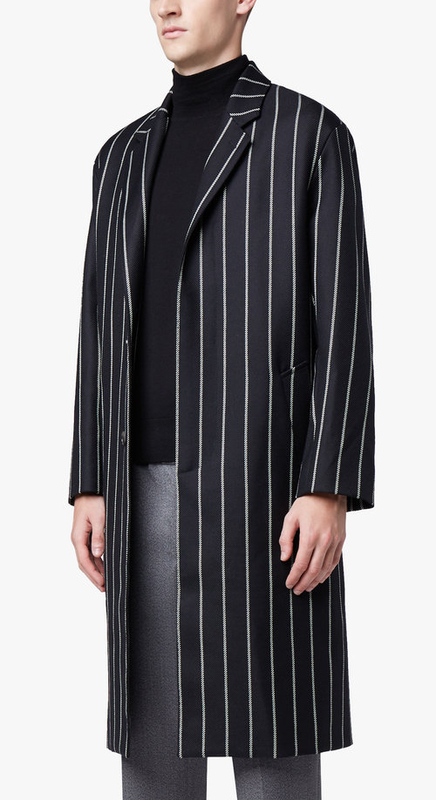 Here's an interesting take on the design from Mackintosh, who have produced a coat in a very broad black chalk stripe. The knee-length woollen coat is made in England. Bold is the word. They say freedom lies in boldness.